I'm not a fan of watermarks on photos. Especially those on military vehicles. I consider this to be part of the human record and they shouldn't be ruined by Getty, Sputnik and especially blogs when they're the original work of a Combat Cameraman for open distribution and use. MOST ESPECIALLY GALLING are private photographers that are given access to military aircraft to take air-air photos and then limit their use. If it's gonna be done then at least do it like this. Don't get me wrong. Sputnik still pisses me off because of these watermarks but at least they're subdued. 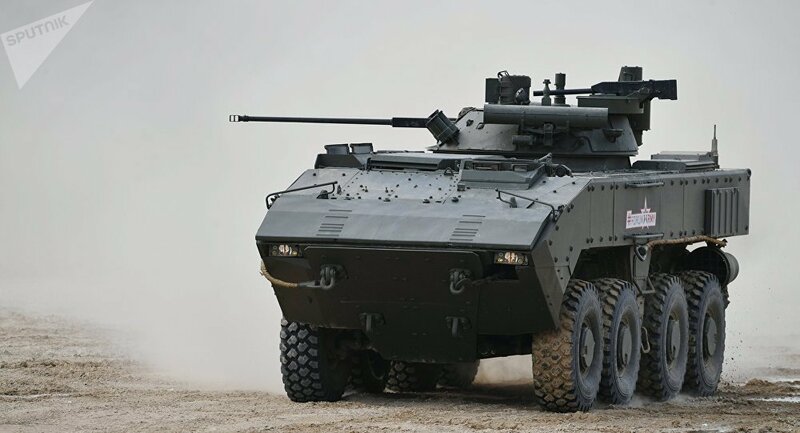 The wheeled tank built around the Bumerang future armored platform will combine the reliability of an armored vehicle, the versatility of an armored personnel carrier and the firepower of a full-fledged tank. 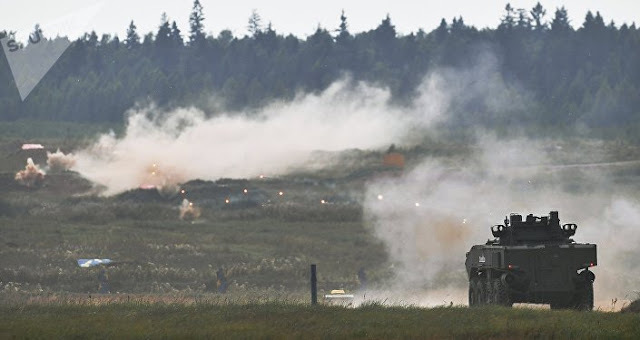 Wheeled tanks are a family of armored fighting vehicles equipped with a tank cannon installed in a fully-rotating turret. Even though less protected than their heavy tracked counterparts, wheeled tanks leave them far behind when it comes to speed, maneuverability and endurance. While a main battle tank breaks down after 10,000 kilometers, a wheeled tank will do so only after 100,000 kilometers. 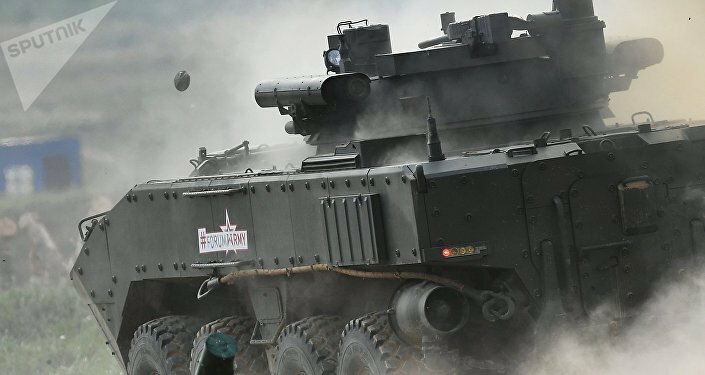 Great endurance, reliability and impressive firepower make it ideal for combat operations on the flanks, in reconnaissance missions, patrols and combat security operations, Viktor Murakhovsky, editor-in-chief of Russian defense magazine Arsenal of the Fatherland, said in an interview with Russian TV channel Zvezda. 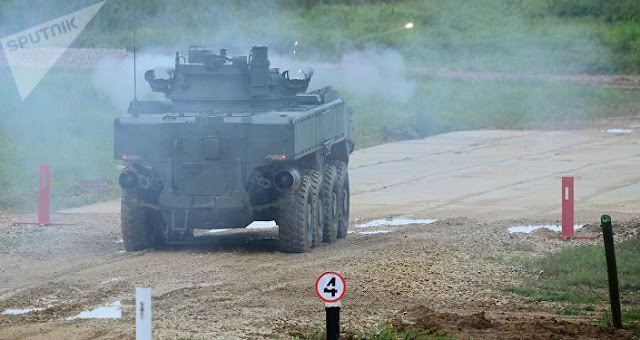 The Russians see the Bumerang Mobile Gun System to operate in the same manner as NATO. I can't put my finger on it but I see this rig as being more for export than for Russian use. The Russian paratroopers probably won't give up their SPRUT-D's for this vehicle, neither will the Russian Marines. As for their Guards Armies I don't see them ...any of them...giving up tanks for a MGS. That means VERY limited Russian use and I bet it's just to give buyers a chance to buy Russian instead of Italian, US, Japanese or anyone else who decides to build this class of vehicles.